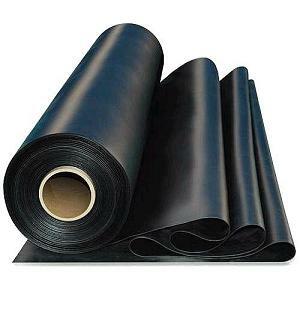 BLACK EPDM Rubber Roofing Membrane, 45 mil, 10x100 ft. Weight: Rolls weigh 320 lbs. 50 foot rolls are available at 160 lbs. DESCRIPTION: WeatherBond BLACK EPDM .045” thick single ply roofing membrane. EPDM is a very elastomeric homogenous rubber roof covering which may be used for new single-ply roof construction and re-roofing applications. It has a very long history of high reliability in all climates.